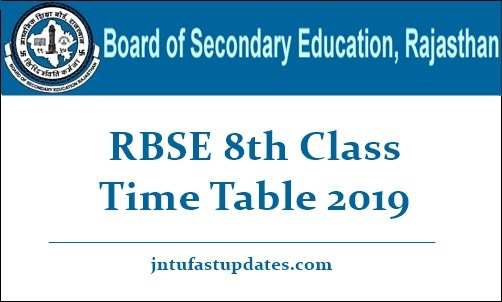 RBSE 8th Class Time Table 2019: Rajasthan Board of Secondary Education Ajmer (RBSE) has recently released the date sheet for 8th class academic examinations 2019. All the students who are presently pursuing class 8th under RBSE can check the time table clearly and observe the subject-wise exam dates from it. Visit RBSE official website, rajeduboard.rajasthan.gov.in to download Rajasthan 8th date sheet 2019. Students can click on the Class 8th time table/date sheet 2019 link on the homepage of the website and download it easily. As per the time table announced by RBSE, class 8th examinations will be conducted from 14th March this year. And the exams will be finished by 27th March 2019. Students who are going to appear for the class 8th end exams in Rajasthan can check the subject-wise exam dates, timings information clearly from this article. Rajasthan Board of Secondary Education (RBSE) is the state level education board situated in Ajmir. The RBSE was established in the year of 1957. The RBSE offers secondary and higher secondary education for the students of Rajasthan. The RBSE offers affiliation for various government/private schools in the state. RBSE academically conducts the board exams for all classes in March/April months and announces the results in the month of May. Ahead of the academic examinations, the RBSE is releasing all the time tables for the March/April examinations. Students pursuing under the board can visit RBSE website, rajeduboard.rajasthan.gov.in for more updates regarding exam dates, results, and various other relevant updates. Students pursuing under Rajasthan School Education Board can check the class 8th date sheet 2019 from the following table. Or the students can visit the RBSE website, rajeduboard.rajasthan.gov.in to download and print the date sheet. RBSE 8th Class Time Table 2019 PDF file can be downloaded from the portal and the students can save it on their laptop/PC to refer it whenever required. Visit the RBSE portal, rajeduboard.rajasthan.gov.in and you will be navigated to the homepage, initially. Search for RBSE Class 8th Time Table 2019 Download link on the homepage. Soon after clicking the link, it will ask you to enter the register number, password or other details. Fill up the required details over there and tap on the submit button. The Rajasthan Class 8th Date Sheet 2019 will be downloaded on the screen. Check the examination dates and take a printout of it to refer it whenever required.